Indonesia is a densely populated country in South East Asia. Infrastructure expansion, establishment of manufacturing industries as well as increasing mining activities would drive the growth of power rental market. However, rising environmental concerns on account of increasing carbon footprint would impact diesel gensets rental market. Further, gas gensets would keep on grasping more market strength as compared to diesel gensets on behalf of offering better power supply support results. 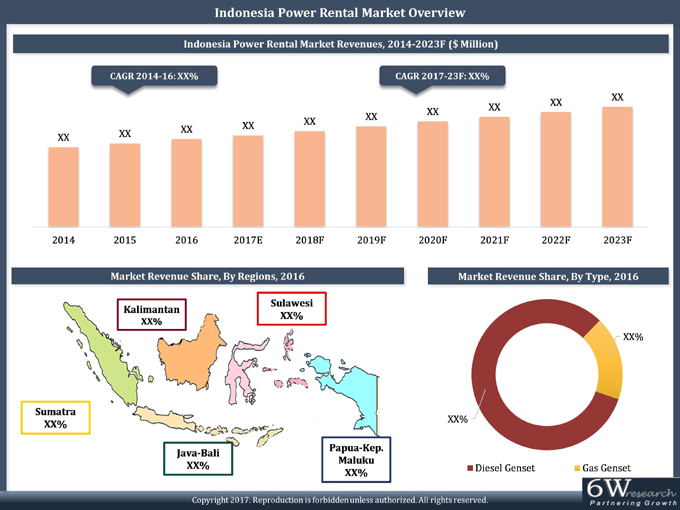 According to 6Wresearch, Indonesia power rental market is projected to grow at a CAGR of 4.6% during 2017-23. The market is anticipated to witness steady growth majorly due to economic transformation and infrastructural development plans over the coming years.